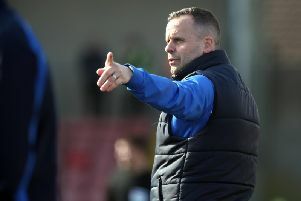 Crusaders manager Stephen Baxter is glad to see Paul Heatley is back in top gear after a slow start to the season. The Crues winger had not been at his best in the opening games of the season but he scored the winner in the Crues 1-0 win against Larne in the semi-final of the Toals County Antrim Shield. That strike was his seventh in seven games and boss Baxter is glad the winger is getting back to his best. “He was playing rubbish and he knows he was playing rubbish. He was snatching at everything and that happens to players. You cannot continue to play week in week out, year in year out at an unbelievable level. “Forward play is all about confidence and see when you are confident you twist on a ball and fire it home, you get confidence and go on a run. “And Paul is that type of player that has a knack of scoring a goal out of nothing. “You saw the one he hit against Larne and it was whistling towards the top corner and I thought - he is back. And Baxter says Heatley is a great gut to have around the dressing room at Seaview. “It’s great to have a guy like Paul Heatley. He is an unbelievable guy and a great character around the dressing room. “He wants to do well and he is a family man with another baby on the way. He is just great. “When he is happy, I am happy. When we win we are all happy - even the wife is happy - but when we are losing it’s a different story.” added Baxter.